After a month of testing, ie the availability of applications in the Preview version, this week all Android phone users will be able to install all three familiar Office applications. 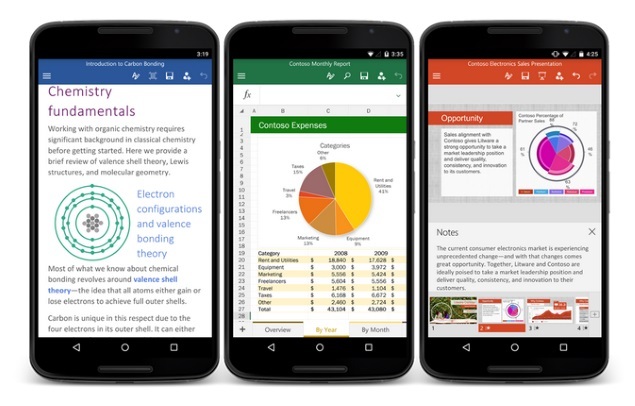 Availability on smartphones comes a few months after Android tablet PCs, so you can say that along with the availability of the iPhone and iPad, Microsoft Office is now available on all platforms used mass. Interestingly, Windows users will have to wait for the 10-storey which will become available from the end of July or the end of the year for mobile phones. Users of Android 4.4 and newer or users of mobile phone with 1GB RAM memory, can download Word, Excel and PowerPoint from the Google Play Store. They are free, but requires Office 365 subscription to unlock the advanced functions to change the documents. The applications are generally the same as the versions for tablet PCs, with a few adjustments for smaller screens, such as the inclusion of the menu on the bottom side instead of the top.